Hydro-Action Products - Septic Solutions Inc. Accessibility. The OPS unit houses all operational equipment in one convenient place. Plus the system can be isntalled as a supplemental unit to existing systems or used with sub-surface dosing technology. The OPS unit houses the control box and the air pump. Aeration Process. When effluent arrives, the ATU immediatley gets to work. 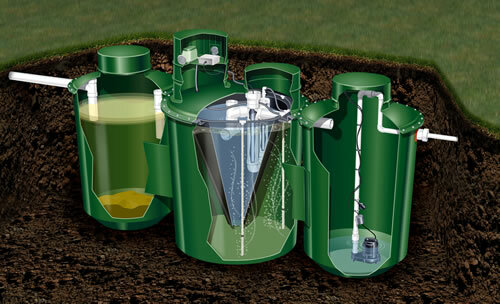 The Aeration Compartment is why the ATU blows traditional septic tank technology right out of the water. A pump injects air into the system through 6 separate diffuser lines to the compartment, where oxygenation begins. Bacteria are force fed oxygen causing aerobic digestion of waste, cleaning the wastewater without chemicals. For Clarification. 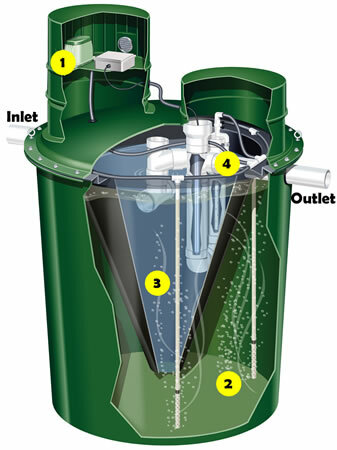 Oxygenated effluent enters the ATU's Clarification compartment, a conically shaped area that separates clarified water from any remaining solids, which settle back to the aeration compartment for further treatment. Clear effluent leaves the Clarification Chamber through the outlet baffle. UV Disinfection. Before the clear effluent leaves the tank, it passes through the UV Disinfection system removing any existing bacteria producing the highest quality of effluent. Engineered With You In Mind! No Moving Parts Inside The Tank! No Filters To Be Cleaned Inside The Tank! The Set-N-Go® Three Tank Installation Package is the most complete NSF 40 Class 1 treatment system available today. It includes a pre-treatment tank, aerobic treatment tank, a pump tank all in one unit. Every factory assembled unit is thoroughly tested for quick onsite installation and accurate operation. This unit comes to the job site completely assembled and uses a smaller hole guaranteeing a quick, easy, and reliable installation. 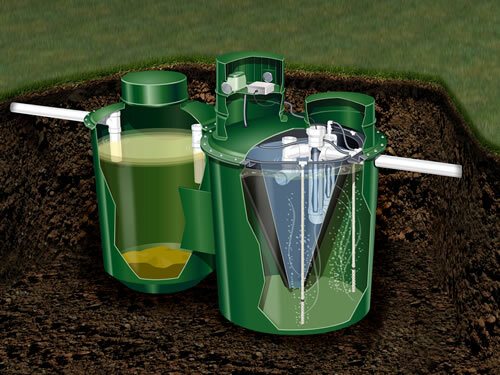 There was a time when buying, installing, and maintaining old fashioned septic systems was hit or miss. With the Hydro-Action onsite wastewater treatment plant, those uncertain times are gone. The innovative design ensures that you will enjoy years of trouble-free service, at an operation cost close to operating a light bulb. Make the clear choice with Hydro-Action today!.